The Original For Over 50 Years • Makes a Great Gift TOO! When your mailbox is hit by a vehicle or snowplow, it can be inconvenient and even expensive to replace. Instead of worrying about the potential danger to your mailbox when a car drives by or the weather takes a turn for the worst, use a SwingClear post. 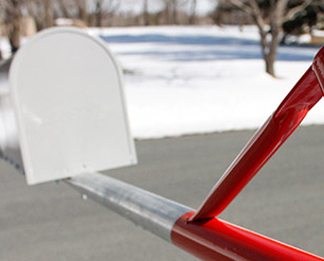 Unlike traditional heavy post mailboxes, SwingClear posts are less of a roadside hazard in inclement weather. Our mailbox posts are designed using a boom system, which swings the mailbox and post arm out of the way when impacted by a vehicle, snowplow, or any other solid object. After the impact, the mailbox returns to its original operational position with minimal damage to the mailbox and none to the post as well as minimizing damage, our mailbox and post kits can also mean the end of shoveling around your mailbox because the area is successfully plowed. Reduce hazards and liability along the roadway. Say goodbye to damaged mailboxes and their posts.